In a recent post for the Working Wildcats blog, senior Ashley Tillman, Human Services major from Penn Yan, New York shares her experience about her internship with the Alzheimer's Association Central New York Chapter in Syracuse, NY. 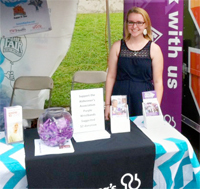 Working primarily in event development and fundraising, Tillman gained valuable experience during the Alzheimer's Association walk season when she was responsible for taking care of individual and team registrations, organizing their information and contacting participants. A few times throughout the semester Tillman also volunteered for the Association's day program that works with adults who have Alzheimer's and other types of dementia. > Read Ashley Tillman's full blog post.